In the darkest night part of morning they came 60,000 strong — to watch undefeated world heavyweight champion George Foreman take on challenger Muhammad Ali. It was another time. The 20th of May Stadium in Kinshasa, Zaire, is now the Stade Tata Raphaël in the Democratic Republic of the Congo, and The Rumble in the Jungle, as it was known, was scheduled to begin at 4 a.m. local time on Wednesday, Oct. 30, 1974. This was so the match originally titled From Slave Ship to Championship would air live on closed-circuit television in U.S. theaters at 10 p.m. EST. Ali was about to prove, once again, why he was the greatest of all time. Ever since the boxing commission stripped the champ of his title and suspended his boxing license for refusing to serve in the U.S. armed forces during the Vietnam War, Ali had been on a mission to reclaim all that had been stolen from him. Ali fought the law — and won, taking his case all the way to the Supreme Court, where he was vindicated in June 1971. Boxing license back, Ali took on then-world champion Joe Frazier in The Fight of the Century in March 1971. It was the first time that two undefeated heavyweights had battled in a title fight. They went the full 15. Frazier won by unanimous decision, handing Ali his first loss. By 1974, George Foreman held the title. Undefeated, Foreman had more than 35 knockouts under his belt, and at 25, seemed an unstoppable force, but Ali, seven years his senior, never lost heart. On most fight posters, the location was not a visual part of the story. Whether held in Las Vegas, Chicago or Miami, the location was simply a matter of logistical information. But with The Rumble in the Jungle, Africa was a central character. “No one had heard the word ‘Zaire,’ ” recalled sports photographer Neil Leifer. “If you want to put your country on the map — what a way to do it. If you wanted the world to know who you were, get the most popular black man on earth to promote it. It was probably a good business move for Mobutu.” Dictator Mobutu Sese Seko, who was noted for his cruelty and for being a master of terror on a grand scale, died in exile in 1997. Leifer, a boy wonder who began his professional career in 1958 at the age of 16, produced arguably the most famous photograph of Ali on earth: the image of him standing above Sonny Liston after throwing “the phantom punch” that sent the challenger to the mat during the first round of the 1965 world heavyweight title fight. A photographer, like a boxer, has to be fully prepared for the fight, to be in peak condition and determined to make history. With more than 200 magazine covers and 17 books to his name, Leifer’s most recent book, The Fight (Taschen) is a triumph of book publishing. Limited to just 1,974 copies, the book features photographs by Leifer and Howard L. Bingham, Ali’s best friend, who died in 2016. Using abridged copy from Mailer’s 1975 The Fight as its departure point, the Taschen volume follows Ali’s path through Zaire, crafting a comeback that blew people away. The book comes inside a slipcase that is modeled after the fight poster, using the same colors and design concept. “An image has to stop you — otherwise you will walk right by it,” said Leifer. “A cover is a poster — and if you take a second look at it, you might want to look inside. That yellow just jumps out at you … you can see it from half a block away.” But it’s the image of Ali and Foreman floating over the continent that invoked the Pan-African sentiment that had resurfaced in the wake of the civil rights movement and the African independence movements. It’s the image of Ali and Foreman floating over the continent that invoked the Pan-African sentiment that had resurfaced in the wake of the civil rights movement. The story belongs to the champion. This is increasingly clear when paging through The Fight. 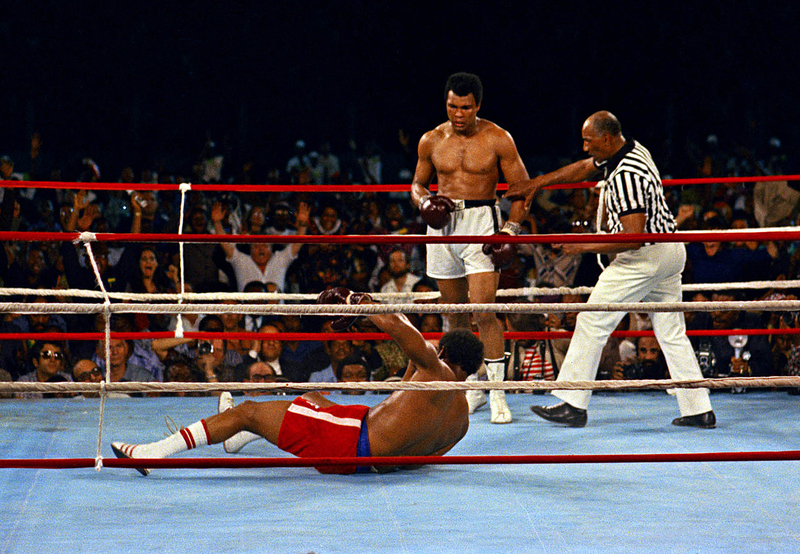 The Rumble in the Jungle was Ali’s return to glory. Unlike Foreman, whose strengths did not translate outside the ring, Ali took advantage of every opportunity that came his way, never meeting a camera or a reporter he did not like. As Mailer reported, after shaking hands, Ali told Foreman, “You have heard of me since you were young. You’ve been following me since you were a little boy. Now, you must meet me, your master!” Foreman blinked. The bell rang, and 30 seconds into the fight, Foreman had Ali on the ropes. They sparred, landing blows. It was an intense round, but people feared Ali would not be able to sustain that level of aggression. They weren’t wrong. Somewhere in the second round, Ali switched it up: rope-a-dope. Determined to rouse himself, Foreman made it back on his feet after a count of 10, but he was finished. With two seconds remaining in the round, referee Zack Clayton stopped the fight. Ali had won the title back. Then he fainted. Soon after the fight, the sky broke open and the rains came pouring down. The rainy season had been two weeks late, and the torrents flooded the stadium, drenching the batteries until the generators gave out. Half of the Telex machines shut down, and pictures and words could no longer get out — but they didn’t need to. Ali lived up to the poster — and did what he came to do as the whole world watched. Miss Rosen is a writer based in New York and has written for L’Uomo Vogue, Dazed Digital, Whitewall, Jocks and Nerds, and Crave Online.